Fair housing seems like a quintessentially American goal. Of course we’re against housing discrimination. Who would be in favor of it? But our nation’s path toward that goal has been long and slow. Support for the Fair Housing Act has been less than robust in Washington, and a surprising number of local governments are both unfamiliar with, and do not reflect the goals of the act in their zoning regulations. But there is more to the story than that. Fair housing remains a priority for many local governments and has become increasingly intertwined with efforts to address America’s affordable housing crisis. 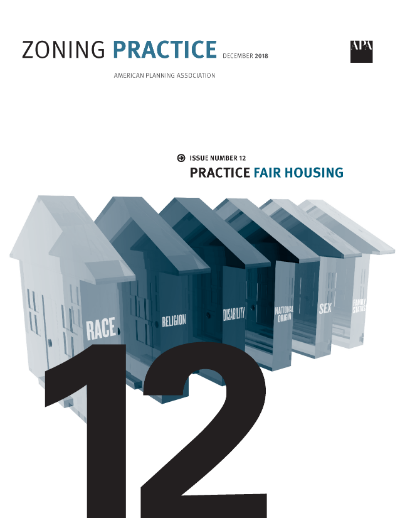 This edition of Zoning Practice reviews the basics of fair housing law, two recent developments in fair housing, and discusses practices to help close the gap between the current reality and the ideal of fair housing. Donald L. Elliott, FAICP, is a Director with Clarion Associates, LLC, a national land use consulting firm. Don has assisted over 40 U.S. communities to update plans and regulations related to housing, zoning, and land development. He is the author of A Better Way to Zone (Island Press 2008) and co-author of The Rules that Shape Urban Form (APA 2012). Don has a bachelor’s degree in Urban Planning and Policy Analysis from Yale University, a law degree from Harvard Law School, and a master’s degree in City and Regional Planning from the John F. Kennedy School of Government at Harvard.